With the hope that someday scientists will advance regenerative therapy in humans, an interdisciplinary team of researchers from Arizona State University and two other institutions has discovered important new clues in exactly how lizards regenerate their tails. In one paper, scientists from ASU investigated the role of a muscle stem cell population called "satellite" cells. Regeneration involves making new muscle, cartilage and tendons and requires cells that will become these tissues in a regrown tail. 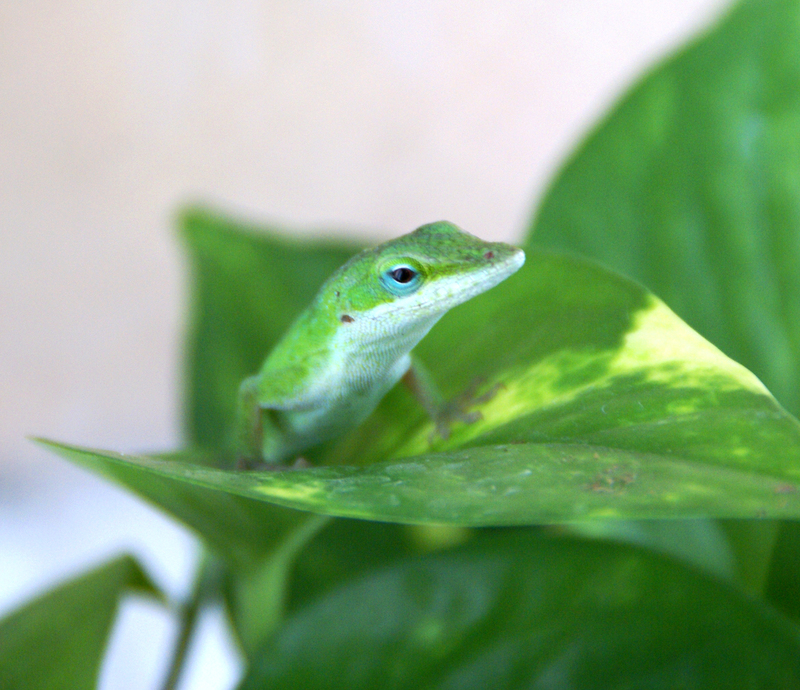 The researchers found that the muscle satellite cells in green anole lizards (Anolis carolinensis) do double duty and can become cartilage as well. This study provides the first functional description of this stem cell population in lizards. By studying the genetic programming in mice and lizards, the researchers hope to find the differences between them that make the lizard more capable of regeneration. In a second study, the scientists found that nerve regeneration in particular, is a critical part of the tail regeneration process. In this study, the researchers allowed lizards to regenerate their tails up to 250 days and then studied the neuromuscular junctions — the connections between nerve and muscle — at different stages. Coordinated tail movements require effective communication between neurons and tail muscles through these neuromuscular junctions resulting in muscle contraction. Together, these findings may bring researchers closer to solving the challenge of creating the capability for limb or organ regeneration in humans. Microscopic image of a 120-day regenerated lizard tail labeled with green fluorescent proteins that mark collagen. This image reveals the bony vertebrae of the original tail replaced with a cartilage structure that surrounds the spinal cord. Peripheral and spinal cord-derived nerves (red) quickly repopulate the regenerated tail at 15 days. Neuromuscular junctions in an original (left) and 250-day regenerated tail (right) are morphologically similar. Receptors on the muscle are labeled in green and peripheral nerves are labeled red. Authors of the two manuscripts published in Developmental Biology. Top (from left to right): Alan Rawls and Jason Newbern. Bottom (from left to right): Joanna Palade, Cindy Xu, Kenro Kusumi, Jeanne Wilson-Rawls, and Rebecca Fisher. Not pictured: Minami Tokuyama, Djordje Djordjevic and Joshua Ho. The research team included Kusumi, Palade, Tokuyama, Wilson-Rawls and Xu, as well as Jason Newbern and Alan Rawls, who are faculty with ASU’s School of Life Sciences; Rebecca Fisher with ASU School of Life Sciences and the University of Arizona College of Medicine-Phoenix; and Joshua Ho and Djordje Djordjevic from Victor Chang Cardiac Research Institute. The National Institutes of Health funded this research through grants. The presidents of Arizona’s three public universities were blunt in their request for support from the business community on Tuesday, explaining the need for the freedom to be entrepreneurial. Michael Crow, president of Arizona State University, said his institution responded to cuts in state funding by finding other ways to generate money. “We adjusted, we adapted and we adopted other revenue sources — in our case, in round numbers, $300 million from the state and $2.8 billion from other sources this year,” he said in a talk sponsored by the Greater Phoenix Chamber of Commerce. But state legislators are looking to limit the ways the state universities can find funding, and the business community should step up and support higher education, Crow said. “We think the business community is and should be our strongest ally. In many individual cases and in the Phoenix Chamber’s case, they are. But not uniformly,” he said. The presidents would like the state Legislature to provide enough funding to pay for half of an in-state student’s instruction — about $7,500 per student at ASU. Currently, after cuts during the recession, state funding covers about $5,000 toward instruction per student at ASU, Crow said. Rita Cheng, president of Northern Arizona University, said that the resident-student-based funding model is key, and that decreased revenue has resulted in higher tuition. But any additional money from the state should not come with more regulation, she said. “What’s important for us is the flexibility and the ability to bring partners on campus to work side by side with students,” she said. Cheng said funding for the universities should not come at the expense of the K–12 system. She would like to see a more broad commitment from the business community. Robert Robbins, who took over as president of the University of Arizona in June, said that businesses have an interest in seeing the K–12 system improve, noting that there are some high schools in Arizona that have never sent a graduate to a university. “It’s hard to recruit someone to the Phoenix office if there aren’t good education opportunities,” he said. “We have to do our job and produce more engineers. But as the digital sciences and biological sciences converge in this rapidly changing world, companies need people with leadership skills, communication skills, critical thinking and creative skills. Robbins said the University of Arizona is making gains in creating more technology transfer. “Over the past few years, we’ve had good success in spinning out companies, but we have to have a partner at the other end,” he said. Crow said that the old model of a public university that’s heavily funded by taxpayers and run like a state agency is dying. “We abandoned the public-agency model and advanced a public-enterprise model,” he said. That means the university’s relationship with the state should evolve. “All we need is one half of the cost of their instruction, and that’s about $7,500 per student per year. The rest of the institution can be financed by allowing us to act in entrepreneurial ways, basically in the way private universities do, by leveraging all of our assets — our property, our technology, our ability to attract international students, our ability to design new programs, our ability to do research,” Crow said. The return on the investment to the state is higher now, he said. “At ASU, it costs the state, per degree we produce, 75 percent less than it cost to produce a degree 15 years ago. That’s a significant achievement.